We’ve been talking so much about 3D printers these days; its futuristic uses in ‘printing’ everything from dwelling spaces to human tissue. So speaking about dot matrix printers seems a little like harking back to the primitive age of the typewriter. It’s a similar mechanism after all; the repeated striking of the ink-soaked cloth ribbon is what produces the printed words or image. However, those of our readers familiar with dot-matrix printers who still use these printers know about the many advantages of dot matrix printers: not only are they very economical to buy and run, they give you plenty of warning when before the ink actually runs out. They can print from a continuous roll of paper and give you carbon copies. 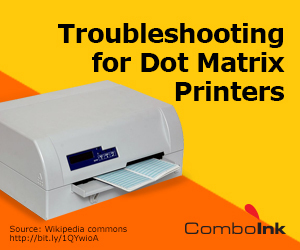 Some of the commonest problems you may have experienced with your dot matrix printers are likely to be paper jams, a strange grinding sound as the printer operates, too much paper wasted between checks being printed, or improper positioning of the invoices/checks (the company logo is cut off, the product description or the cents column is clipped or beyond the range of the printed sheet etc). Sometimes the printer erroneously detects single page paper feeds rather than a continuous roll of paper and at times the printer keeps printing on the same line (the paper won’t move as it should). Sometimes the print smears and other times it is faint; at times the paper wrinkles. The first thing you want to check is that your printer is plugged in properly, with all cables connected. Also, check that your printer is properly set up and configured as per the manufacturers’ instructions. If you’re configuring the printer for the first time, it may be a good idea to download the latest printer driver from the manufacturer’s website. Your printer should be configured to print the correct size and type of paper: adjust the paper feed selector for thickness (to prevent the paper slipping) and select the right option: for continuous printing or page printing. Ensure that the printer isn’t set to linefeed after each line (this will give you double spaced printouts). Also, ensure that the ribbon isn’t used up (this will give you light or poor quality printouts) and that it is properly installed (incorrect installation could mean that the printer head is moving but you’re not getting anything printed). If the paper bunches, jams up or has dimples, you need to check that the paper is properly aligned and that the tractor feed wheels are locked properly in place. To remove a paper jam, rotate the platen knob, remove the jammed paper and reinsert. Also, ensure that there is reverse tension on the paper so it doesn’t bunch up. Sometimes the paper tears – this happens when the pins are frozen or installed improperly. They may need adjustment or replacement. If your printouts are such that the company name at the top of the total amount at the bottom, the itemized list on the left for the amount column on the right are getting clipped, you will typically be able to resolve the problem with Windows Explorer – choose help and support and go to print drivers and check the print settings to adjust or reset. If your printout is too light or smudgy, check the print settings in Printer Setup. Check print resolution (draft, normal or best quality) and choose the correct option. To choose continuous printing, select the right option from the paper feed option. If you find that your printer cannot print ASCII characters with code above 127, your data length may be set incorrectly and may have to be reset. If you have common dot-matrix problems and troubleshooting suggestions to share, we’d appreciate hearing about them in the comments segment below.